Cold water steeping is a new and popular way to make tea in Taiwan, especially during the summer months. 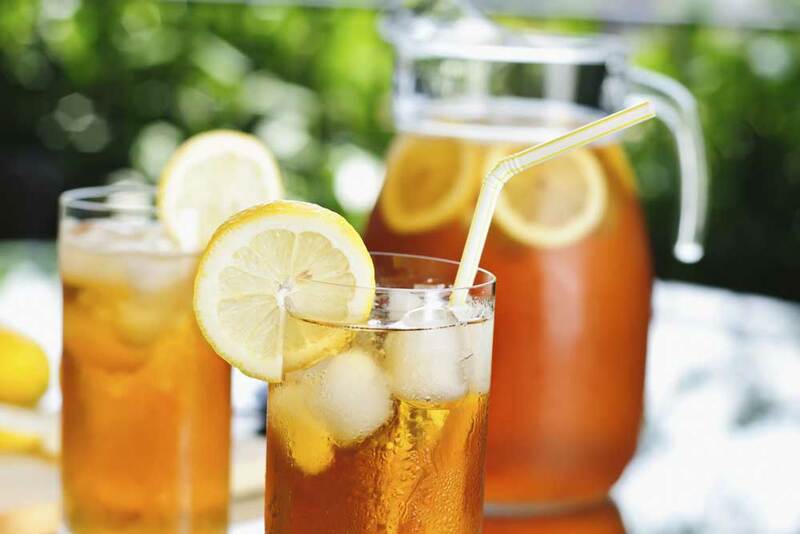 In this post we’ll explore the antioxidant and health properties of cold water steeped tea and how they compare to traditionally prepared tea. We’ll also go over studies comparing green and white teas, the results of which just might surprise you. Hot infusions: 7 minutes in 90 degree (Celsius) water. Source: Hot vs. cold water steeping of different teas: Do they affect antioxidant activity? While hot infusions had somewhat more antioxidants than cold infused teas, we aren’t talking about massive differences, differences that may not have any real health effects. Yang and colleagues from Chung Shan Medical University in Taiwan also compared the effect on various steeping methods to caffeine and antioxidant content. This graph shows the effect of time and water temperature (4C or 25C). Source: Effects of different steeping methods and storage on caffeine, catechins and gallic acid in bag tea infusions. Someone could teach these researchers better data presentation techniques. They crammed so much data into those small graphs that it’s hard to read them. Nevertheless, the overall message is that as steeping time increases, so does the antioxidant and caffeine content. Also, the values were higher for tea steeped in 25C water than in 4C water at all times. We can say that cold steeped tea is not quite as ‘potent’ as tea hacked in hot water. On the other hand, cold water steeped tea also has less caffeine and tastes better. 4 to 5 minutes in boiling water tends to make very bitter tea – a price you have to pay if you want to extract maximum amount of antioxidants. Antioxidant degradation is a potential concern with cold water steeping, which requires much longer steeping times. Yang et al. also checked if storing finished green tea degrades its antioxidant content. This result surprised me since in an earlier tea hacking post I reported about another study showing a marked degradation of green tea antioxidants. Here are the results from Yang et al. As you can see, storing green tea in 4C for 48 hours had no effect on EGCG, the same holds true also for other tea antioxidants, but I’ll just report the data for EGCG. 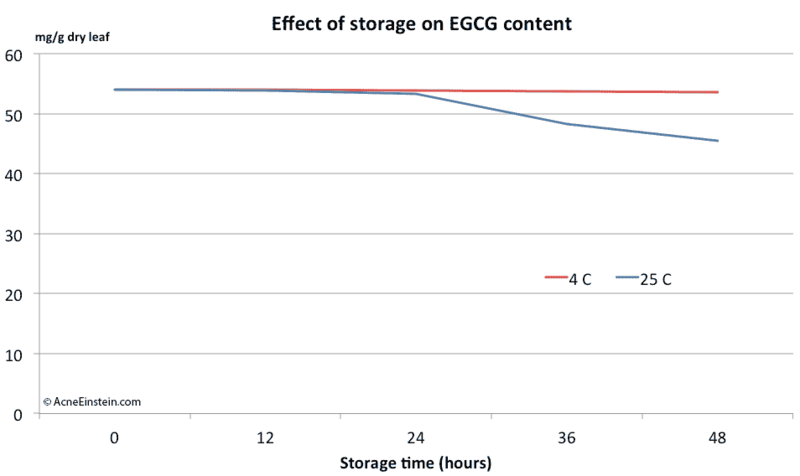 When stored in 25C EGCG content started dropping after 24 hours, but ever after 48 hours of storage only about 15% of the EGCG had degraded. I don’t know how to reconcile these data with the data I reported earlier. The authors of this paper didn’t detail the storage conditions, other than temperature. I assume that the tea was protected from light and oxygen (two things that destroy antioxidants). The take-away from here is that it’s ok to store tea for 12 to 24 hours in fridge. But given the earlier data I reported, I wouldn’t store finished tea longer than that. Is white tea better than green tea? White tea is made from young budding tea leaves and is less processed than green or black teas. People therefore assume that white tea is healthier than green tea (because of the processed = bad meme). Carloni et al. tested this assumption. The biggest problem in comparing different tea qualities is the massive variation between cultivars. Teas grown in different conditions (soil quality, environmental conditions, etc) can have massively different antioxidant levels. In this study the researchers eliminated this problem by using the same cultivar (i.e. the same plant grown in the same soil and under identical conditions). The only difference was the degree of processing. Surprisingly, green tea had over 2 times more EGCG than white tea. I can only assume that the processing green tea undergoes causes chemical reactions that create EGCG and other antioxidants. All tea types had similar levels of caffeine. Unachukwu et al. tested different commercial preparations of green tea and white tea. The researchers purchased 8 different white teas and 19 different green teas available in China. 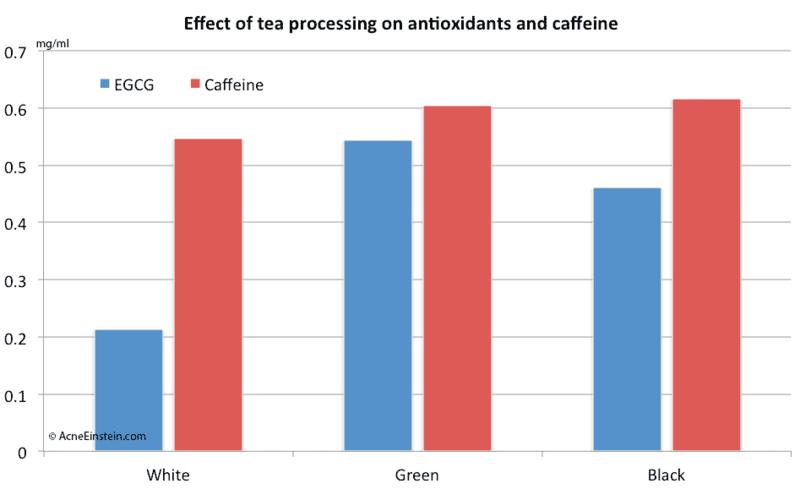 In other words, there’s no real difference between antioxidant levels in green and white teas. White teas also contained slightly more caffeine than green teas. Rusak and colleagues from University of Zagreb, Croatia, confirmed these findings. 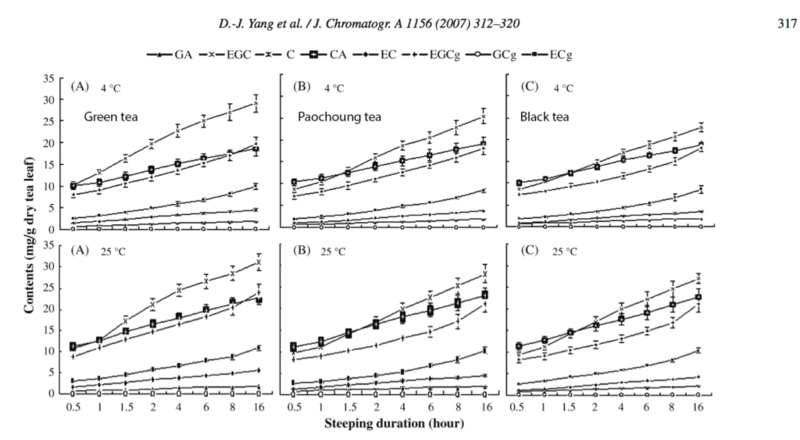 They bought several green and white tea samples from a speciality tea shop in Croatia and measured catechin content and antioxidant potential of brewed teas. Their results also showed 20 – 30% higher catechin levels in green teas, a finding that was consistent in all measures of antioxidant levels and potential. Based on these studies (and others I’ve seen) green tea seems just as healthy as white tea. Other than taste preference, I see no good reason to pay premium for white tea. One caveat I have to mention. Vendetta and colleagues (the research team in the first study in this post) showed that white tea faired better in cold water steeping than in hot water steeping. They speculate that white tea may have antioxidants that are destroyed by heat. But nobody has confirmed this and I just mention it as sake of completion. Ever since a reader tipped me off to cold water steeping I’ve been testing this. And I have to say I’ve been converted. This is an easier way to have green tea available at all times. I usually have a bottle brewing at all times. In the evening I just dump tea leaves into a bottle, fill it with water and put it to the fridge. The tea is ready in the morning and I’ll finish the bottle during the day. Cold water steeped tea is not quite as potent as tea hacked in hot water, but it also has less caffeine and tasted better. And I find I drink more green tea when I have it readily available. Hot vs. cold water steeping of different teas: Do they affect antioxidant activity? Effects of different steeping methods and storage on caffeine, catechins and gallic acid in bag tea infusions. 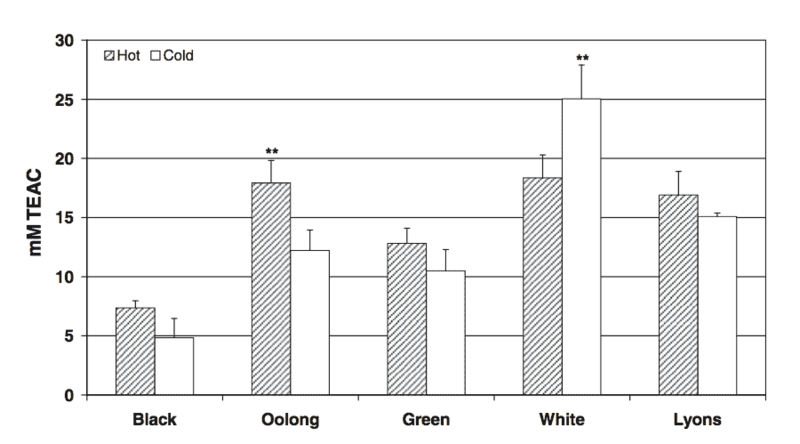 Antioxidant activity of white, green and black tea obtained from the same tea cultivar. Phenolic content and antioxidative capacity of green and white tea extracts depending on extraction conditions and the solvent used. Hi Seppo, do you mean that you put green tea leave in a bottle and add water (not hot) into it and leave it in the fridge overnight? I usually have hot Sencha (tea bag) from Japan. Is there any better options than this or I’m on the right track? Thanks. Yes, that’s what I do. I just put loose leaf tea on a bottle, fill it with water and put it to fridge for 8 to 12 hours, usually overnight. That way the tea is ready for my breakfast. It doesn’t really matter whether you brew the tea hot or cold. Hot water brewing may get more antioxidants from the tea, but I find cold water brewing more convenient and because of that drink more tea. So feel free to do either way. hello seppo! ive been brewing my powder matcha in hot water which can be a hassle sometimes but i would prefer cold brewing my tea. my question is, can i cold steep powder green tea using the same procedure you use with your cold loose leaf tea drink? Yes, you can also brew powdered tea with cold water. The form of the tea doesn’t really matter. Soo.. w/c one is updated? Hot or cold(fridge)? When you store tea the antioxidants degrade quite rapidly. So it’s not a good idea to store it for too long. You can make the tea last a bit longer if you add some vitamin C powder as a preservative. I still wouldn’t store it for longer than a day. I’d say that you can do it either way. I do cold steeping mostly because it’s convenient for me and it’s really hot in there (Thailand), so I need something cold to drink in the morning. Seppo.. forgot to ask this. I get pimples only on certain spots of my face.. even during breakouts. It’s never the whole face. The left area of my face is more affected by acne, right side is much clearer. What do you think? I wrote a post about face mapping, please see that for details. 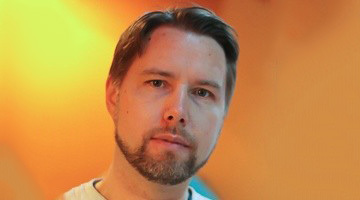 The short story is that there’s no reason to believe face mapping gives any useful information or that it’s anything but a massive case of confirmation bias. I’m trying to compare my notes from reading your articles regarding green tea. If I’m understanding correctly, when I hot-brew my green tea, I should add some Vitamin C and sugar to help maintain benefits and to store it for up to 8 hours. In this article regarding cold-water steeping, you mentioned being able to store it for 12-24 hours. Is this recommended storage time for plain green tea? Or should I also be adding Vitamin C and sugar to it when I use the cold-water steeping method?